The newest active region that has rotated into our view, AR 10652, is one of the largest and most active we have seen since the remarkable outburst of solar activity last October. The new region's size is unusual this long after the maximum period of solar activity in the solar cycle. Viewed from the earth with a filtered telescope, the most obvious feature of the active region is the large, dark sunspot, with an area about twenty times Earth's. One can even see the spot with solar viewing glasses even without any magnification. When viewed as a video clip in extreme ultraviolet light, the region's true dynamic nature comes through strong and clear. 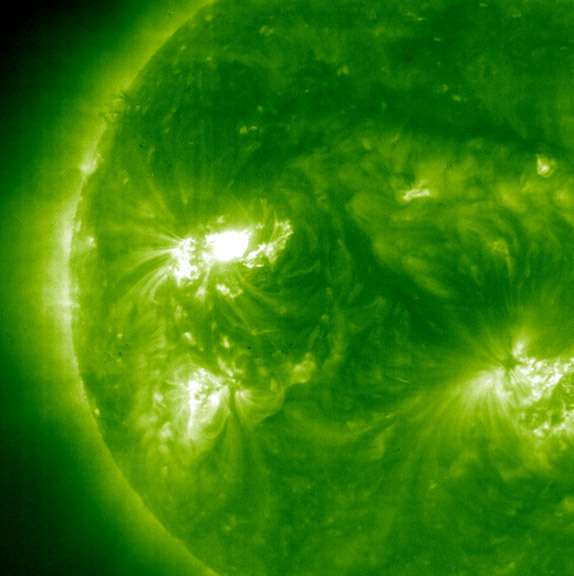 Over three and a half days, the region blew off several flares and coronal mass ejections (CMEs). More subtle but also very interesting is the continual activation, and frequent ejection, of magnetically confined plasma around the outside of the region (seen best in the close-up clip). Over the next week or so, this hot spot holds the potential for unleashing many more solar storms, some of which may be directed at the Earth.